We’ve all seen clips of early, scratchy films showing a woman dancing or blacksmiths at work, films more like experimental documentaries than anything else. But have you ever wondered: what were the top 10 earliest films ever made? It’s not an easy list to make, anymore than it’s easy to decide which of the many Victorian inventors receives the most credit for the cinema (Marey? Edison? Muybridge? Friese-Greene??). First, we must determine what counts as “film.” Before the use of light-sensitive paper and celluloid, several photographers had invented cameras capable of taking photos in quick succession, capturing, say, an animal’s movements one shot at a time. (Eadweard Muybridge pioneered this method.) But it’s usually agreed that the earliest bona fide films were the ones shot on light-sensitive strips of material, much the way they are today (or were, until digital started taking over). It can also be tough to determine an exact chronology for the earliest films, so the following list should be considered a little less Gospel than guideline. In some cases where a “series” of brief films were shot by the same studio in the same vague timeframe, I’ll be counting them as a single entry. The one that started it all. 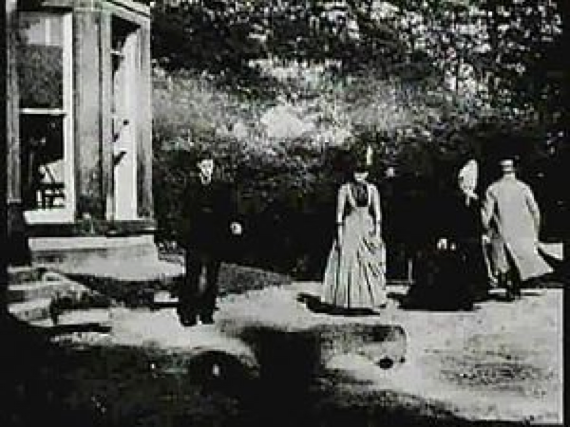 While in Leeds, England on October 14, 1888, French inventor Louis Le Prince decided to try out his stubby-refrigerator-sized camera in the garden of his parents-in-law Joseph and Sarah Whitley. 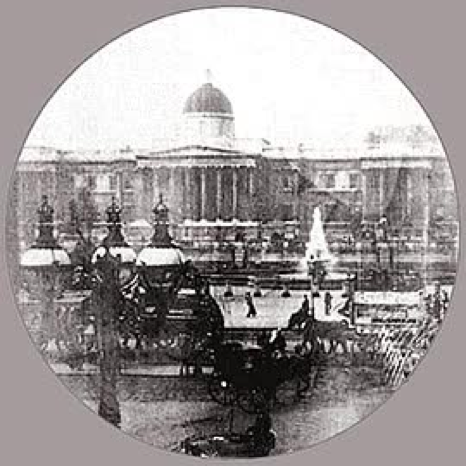 We see Joseph, Sarah, friend Annie Hartley, and Le Prince’s brother Adolphe apparently strolling in circles just to give Louis some action to shoot. (Sarah’s laughing and walking backwards.) Only 52 frames survive, but I’m sure you and I can agree that we’re grateful for those two seconds or so of footage! This was the second film shot by Le Prince, probably not long after Roundhay. He filmed from an upper window of what was then called Hicks the Ironmongers. Today the light-colored brick building is an estate agency, and bears a blue plaque commemorating Le Prince’s day of filming. The third work by–guess who?–our friend Le Prince. This was the last film of his that survives and depicts his brother Adolphe playing an accordion by Joseph Whitley’s front steps. Why is this the final Le Prince film? Not long before he was to embark to the U.S. for a promo tour of his new camera, he got on a train to Dijon, France, and…was never seen again. This disappearance remains a mystery to this day (theories range from regular ol’ murder to the very dubious idea of fratricide). Filmed in Thomas Edison’s famed Black Maria (the world’s first film studio), the two very warped, scratchy Monkeyshines films are essentially camera tests a few seconds in length. No. 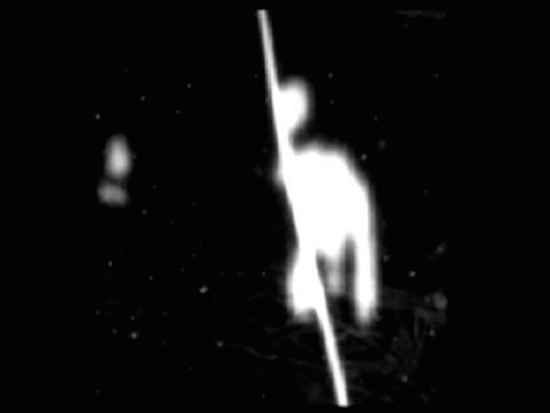 1 shows a figure in white gesturing against a black background, and No. 2 shows the same figure waving his arms and bending from side to side. A third Monkeyshine (the word for “mischief making”) is lost. 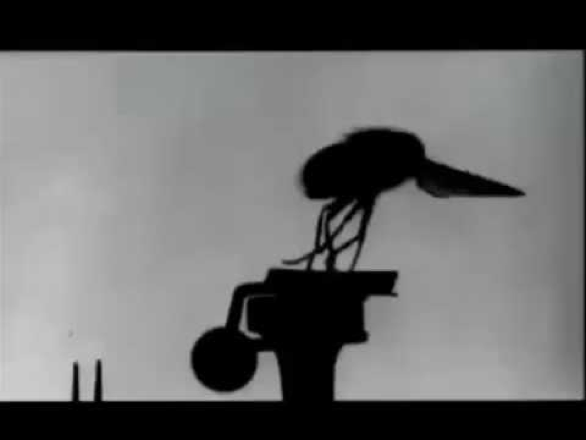 Some historians dispute whether the films were made in 1889 or 1890, but they do seem to be the very first ones made in the U.S.
Étienne-Jules Marey used his chronophotographic gun, a camera which looked, well, exactly like a chunky gun, to take this closeup shot of a fly taking flight. 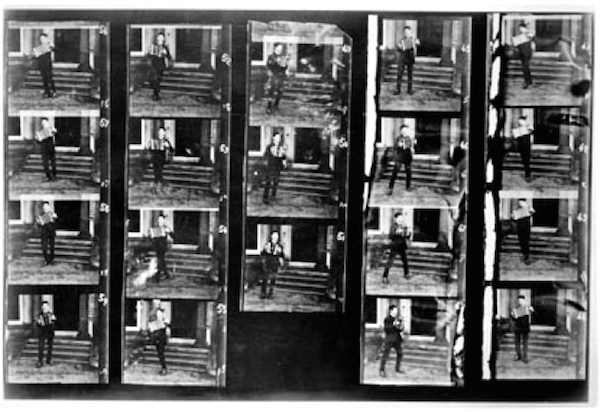 Marey’s invention took sequences of photographs similar to the famous ones by Muybridge. 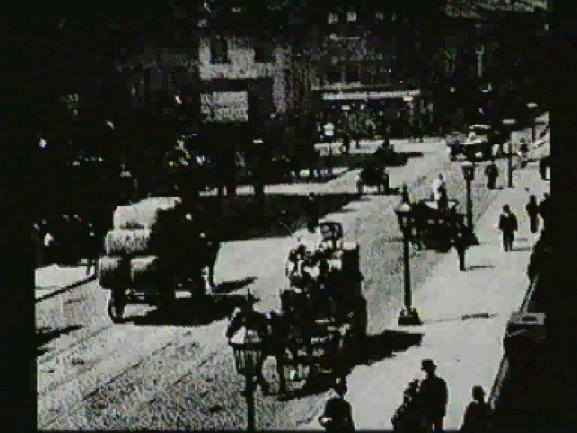 By 1890 he figured out how to operate it with film strips, making him officially one of our earliest filmmakers.. 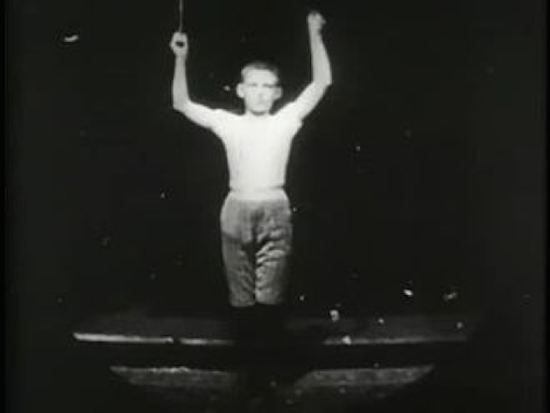 Inventor William K-L. Dickson, one of Edison’s most skilled employees, created this little film to demonstrate Edison’s kinetograph–making it the first American film to be screened for the public. 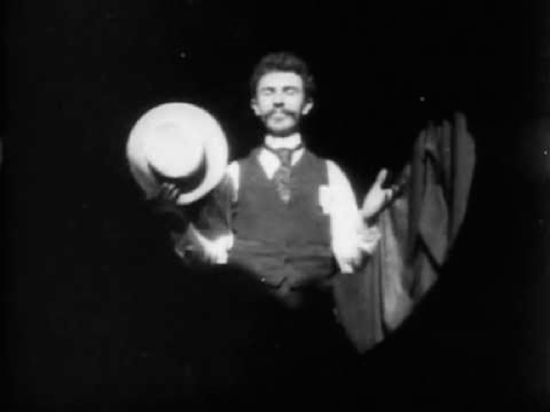 Three seconds of it survive today, showing the mustachioed Dickson passing his hat from one hand to another. Apparently in the original film he also bowed, smiled and waved at the camera. 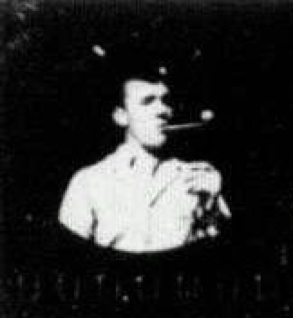 James C. Duncan was a member of Edison’s staff and “starred” in several of the earliest Black Maria experimental shorts: Duncan Smoking; Duncan and Another, Blacksmith Shop; and Duncan with Muslin Cloud (all 1891). The titles are pretty self-explanatory. A teenaged boy, apparently an athlete of sorts, does an Indian club-twirling demonstration for the camera, although we only see a few seconds of it (these clubs were popular for strength-training exercises). This was yet another Edison product, and we can assume the original probably showed a longer demonstration. 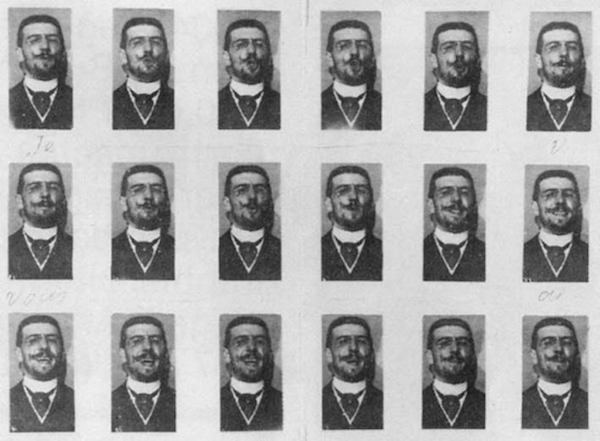 Georges Demenÿ was an assistant to Étienne-Jules Marey, and was perhaps the earliest filmmaker to pursue the commercialization of moving pictures (rather than just using them for scientific purposes). Hector Marichelle, professor and director of the National Deaf-Mute Institute in France, had asked Demenÿ to make films that would help instruct deaf and mute students how to lipread. Demenÿ took this closeup of himself saying “je vous aime” (“I love you”). The experience lead Demenÿ to feel that commercialization was a part of cinema’s future, which lead to a break with Marey. You might say that Demenÿ was the more prophetic one. While these films were merely very simple, no-frills exercises in the new motion picture technology, they are incredibly important pieces of our cultural history. We can only imagine–and hope!–that as the decades and centuries go by, their value will become nearly incalculable to future generations. This was very interesting. I managed to track down all of these on youtube except the Duncan films. The fly taking off was my favorite, though I was also quite taken by Monkeyshine 2. I decided it was someone tossing a pizza and demonstrating its special levitating qualities. In the end I was side-tracked by old films of Loie Fuller dancing. You are really opening new worlds to me. I’m thrilled to hear that, Gloria! Thank you for reading. Great piece, Lea! It’s fascinating to look back at our foundations in history. So much has occurred in film in the century plus since those early days. This is awesome! I really need to give silent films more of a chance. I have seen many of them. However, I don’t watch them too often. I really need to understand where film came from, and how silent films influenced other films that came after them. I think the one I would most enjoy is “Je vous aime”. It seems radical, even by today’s standards. Without its context, it does seem surprisingly avant-garde, doesn’t it? Studying how early silent films influenced later ones is one thing that continually fascinates me about the whole era. It seems that whenever I think, “Ok, this gag certainly originated in this 1908 comedy,” an even earlier comedy pops up with that same gag. Usually it helps to just assume that Georges Melies did it first. Melies seemed to do EVERYTHING first, I swear! This really puts into perspective how recent film is! I always wish we had more moments in history recorded & now I am so thankful for our technology to preserve all of these time capsules. I need to appreciate silent films more, they really were the foundation of everything I know and love! I like to imagine what it would be like to see film footage from 200, 300, or 500 years ago…just think, future generations WILL be able to experience that, which is why film preservation is so incredibly important. Thank you for reading, much appreciated!